President Obama’s time in office is winding down. Time is of the essence. 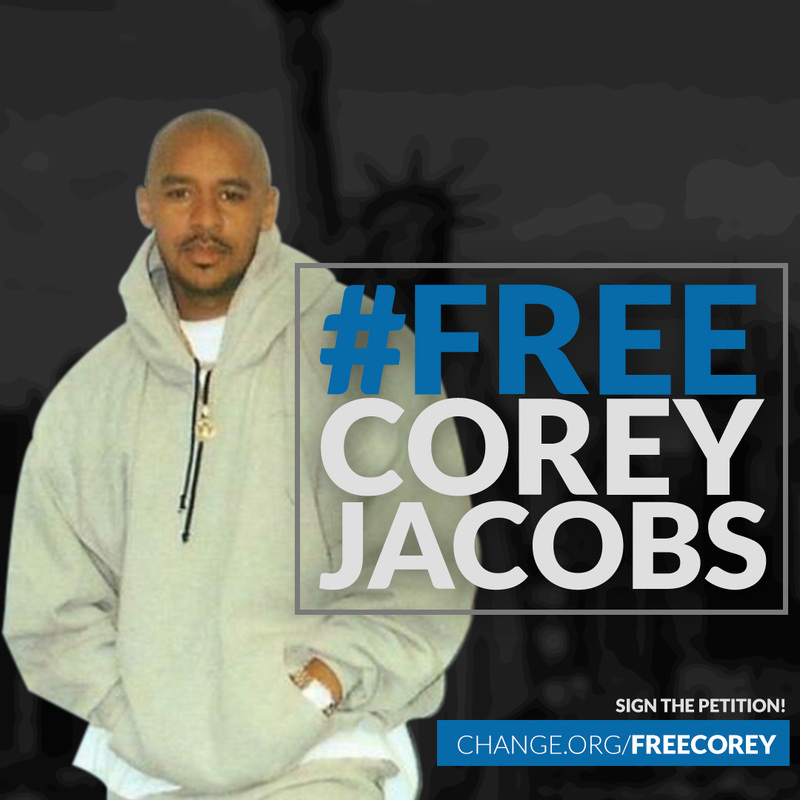 It is our sincere hope that you join the push to free Corey Jacobs to help ensure he does not spend the rest of his life in a federal prison as a non-violent drug offender. 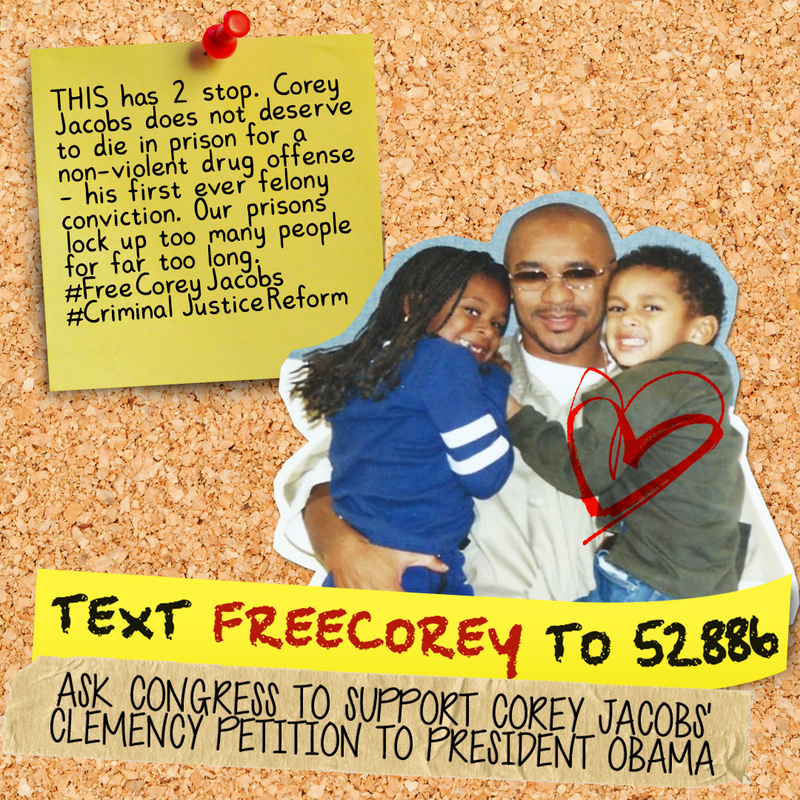 Sign the online petition urging President Obama to grant Corey’s pending clemency petition. 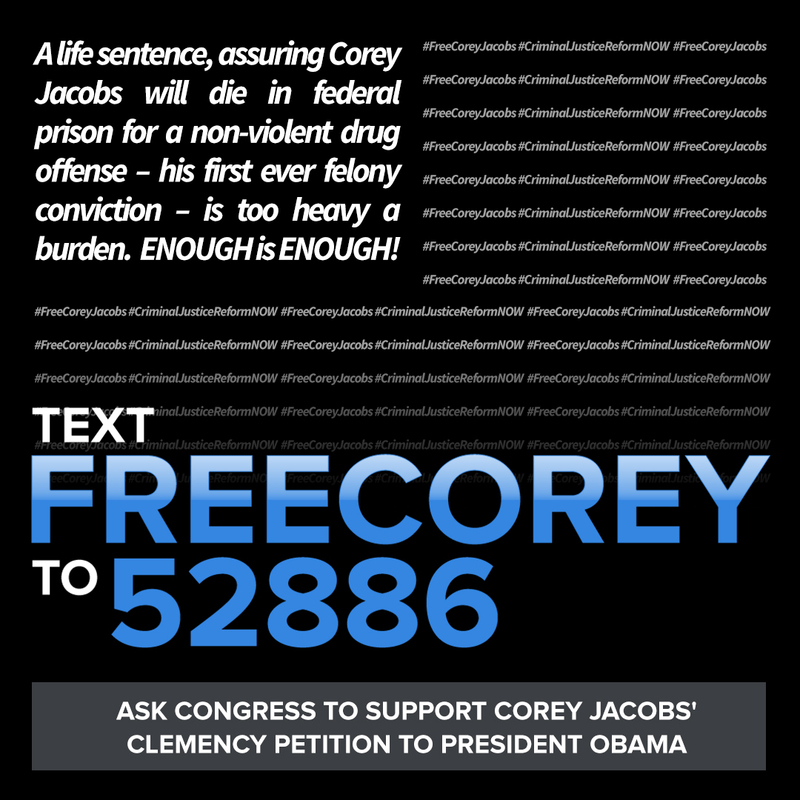 Write a letter to President Obama and/or the Pardon Attorney supporting Corey’s pending clemency petition. Guidance for support letters below. Click here to download a sample letter. Urge Congress to act swiftly to pass criminal justice reform bills. Please direct any questions you may have to Corey’s attorney. Help Corey by sharing the following images on Instagram, Twitter, Facebook and other social media outlets. WHAT IS THE STATUS OF COREY’S CASE? 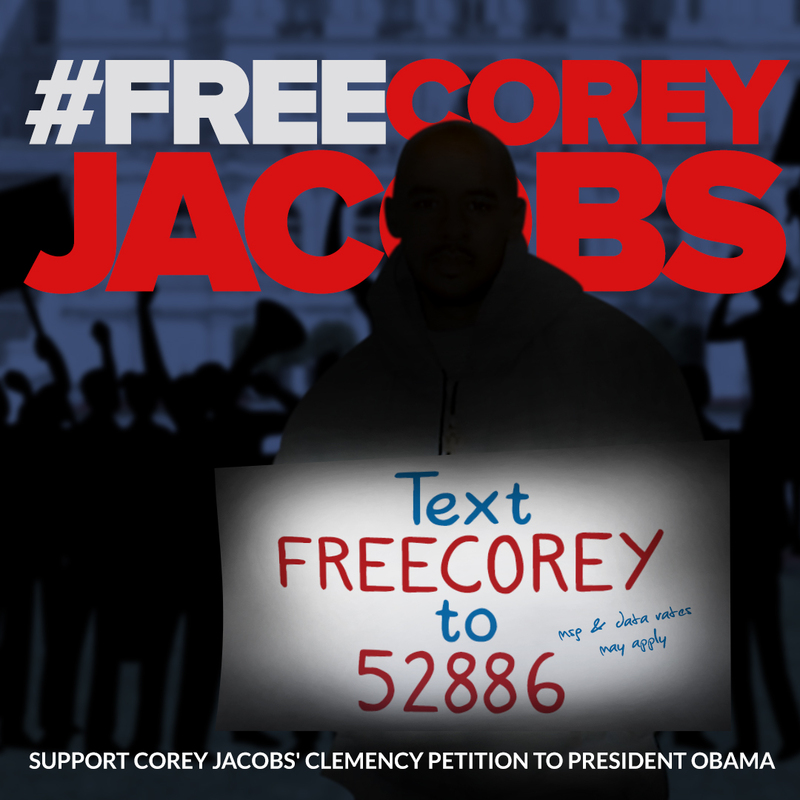 With no relief available through the courts at this time, Corey’s only hope for freedom is clemency from President Obama. President Obama holds the exclusive power to reduce Corey’s sentence through the clemency process. Corey’s clemency petition is currently on file with the United States Office of the Pardon Attorney. Clemency is a plea by federal prisoners to the President of the United States for mercy. The President has the exclusive power to grant clemency pursuant to the United States Constitution. This means that his decision to grant clemency cannot be challenged. If granted, clemency reduces a federal prisoner’s sentence. To receive clemency a person must first file a petition with the Office of the Pardon Attorney. Once the petition is submitted to the Office of the Pardon Attorney, the Pardon Attorney will review and write a recommendation to the President to either grant or deny the petition. That recommendation is forwarded to the Deputy Attorney General, who forwards it to the White House if she agrees with it. Once a recommendation is sent to the White House, it will be referred to the Office of White House Counsel, which will review it and offer advice to the President. The President then makes the final decision. WHAT IS THE DEPARTMENT OF JUSTICE’S NEW CLEMENCY INITIATIVE? President Obama has shown he is committed to restoring the sense of fairness at the heart of our justice system. As of today, he has granted commutations to a total of 187 deserving people – more than the last five presidents combined. WHO SHOULD WRITE A LETTER OF SUPPORT FOR COREY? Anyone wishing to write a letter of support for Corey should do so. WHO SHOULD I WRITE A LETTER OF SUPPORT TO? Write either the President, the Pardon Attorney, or BOTH. WHAT FORMAT SHOULD I USE FOR MY LETTER? Your letter should use proper letter format and be no longer than 1-2 single-spaced pages. Put the date first, then the name of the person you are sending the letter to, then a subject line. WHAT SHOULD BE IN MY LETTER TO THE PRESIDENT? Your message to the President is critical to Corey’s success. First Paragraph: Use this paragraph to get directly to the point. For example, I am writing in support of Corey’s pending clemency petition. Corey has served over 16 years in prison for his role in a non-violent drug conspiracy. This was his first ever felony conviction and he has more than paid his debt for his crime. Keeping Corey in prison for the rest of his life serves no useful purpose to himself or to society. Second Paragraph: Establish your connection to Corey. For example, I learned about Corey’s case through [his family, a friend, his website, social media] OR I grew up with Corey in the Bronx OR I have known Corey since [high school, college]. Then explain why Corey deserves clemency. Please review this entire website for an in-depth look into Corey’s story and extensive rehabilitative accomplishments. Below are examples of reasons why Corey deserves clemency you may wish to include in your letter. What you have learned about Corey’s tremendous accomplishments related to self-improvement and personal growth in prison despite the fact of having a life sentence with no chance of parole. Corey’s young age during his involvement in the conspiracy – he was only in his early twenties. What you know about Corey’s incredible character and potential to succeed upon release. Your belief that reuniting Corey with his children and offering him a second chance at life is important, worthwhile, and in line with yours and America’s beliefs about mercy and forgiveness. Corey’s good behavior and service to others in prison. Ways Corey has positively impacted your life. Corey’s complete acceptance of responsibility for his actions and his incredible remorse and desire to give back to the community. Ways society would benefit if Corey was released. The love and support of Corey’s friends and family. The unfairness of Corey’s sentence to life in prison for a non-violent offense. This was Corey’s first ever felony conviction. Life without parole is the second most severe penalty permitted by law in America. Corey was essentially sentenced to die in prison for a non-violent drug conspiracy. The judge had no choice but to give Corey a life sentence because the federal sentencing guidelines were mandatory at the time and not discretionary as they are today. Absolutely no violence or threats of violence were involved in the offense. The judge who sentenced Corey to life in prison wrote a support letter for Corey’s request for clemency and writes he is certain he would not have sentenced Corey to life if federal laws at the time had not virtually mandated it. The judge also writes that even under current federal laws, he would not have sentenced Corey to life in prison. The changing climate towards fairness in federal drug sentencing. Republicans and Democrats in Congress support criminal justice reform. Corey was sentenced under a federal sentencing scheme related to crack cocaine penalties that has been publicly denounced by members of Congress since Corey’s incarceration. There have been paramount developments in Congress and the Sentencing Commission drastically reducing sentences for crack cocaine offenses. Third Paragraph: Summarize and reiterate that Corey does not deserve to die in prison. For example, There is no doubt that drugs harm our communities, but a life sentence for a non-violent drug conspiracy is too harsh. Corey accepts responsibility for his actions and has shown over the past 16 years in prison that he is deserving of a second chance. His continued incarceration is truly a waste of human life and taxpayer dollars. Corey does not deserve to die in prison for a non-violent drug offense. I pray that you mercifully consider Corey’s pending clemency petition and give him the opportunity to re-enter society and prove that he has learned from past mistakes. Thank you for your time regarding this urgent matter. Be SURE TO make the letter your own. Corey’s sentence is gravely unjust and he is truly deserving of a second chance. Write from your heart and just let the words flow naturally. DO NOT argue that Corey is innocent of the crime. DO NOT argue the facts of Corey’s criminal case. DO NOT speak ill of or insult the government or the criminal justice system. Remember that a request for clemency is a plea for mercy. Your letter must be compelling but respectful. We do not want to offend the President, the judge, or anyone involved in Corey’s case. Be passionate but very polite in your letter. I see many cases like this where young, non-violent, first time offenders are given life sentences, as if their lives mean nothing and rehabilitation is not a possibility for them. Although we may not be able to save them all, we now have the chance to help Corey's most important dream become a reality and allow him the chance to prove to the world that his life matters and that his past mistakes don't define who he is as a man 16 years later.